Banquets with Geisha entertainment is one of Japan’s unique forms of hospitality. 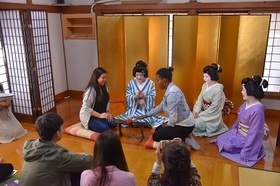 This program offers you the opportunity to enjoy songs, shamisen music and dances performed by Kagurazaka’s Geishas in their training house called Kenban, which is normally closed to the public. Participants can also try playing games that Geishas often play in banquets. English interpretation is available for non-Japanese-speaking participants.